Cousteau was born on 11 June 1910, in Saint-André-de-Cubzac, Gironde, France to Daniel and Élisabeth Cousteau. He had one brother, Pierre-Antoine. Cousteau completed his preparatory studies at the Collège Stanislas in Paris. In 1930, he entered the École Navale and graduated as a gunnery officer. After an automobile accident cut short his career in naval aviation, Cousteau indulged his interest in the sea. The accident caused him to break both his arms and could have even killed him. This caused Cousteau to have to change his plans in becoming a naval pilot, but it eventually worked out because of his passion for the ocean. On 12 July 1937 he married Simone Melchior, with whom he had two sons, Jean-Michel (born 1938) and Philippe (1940–1979). His sons took part in the adventures of the Calypso. In 1991, one year after his wife Simone's death from cancer, he married Francine Triplet. They already had a daughter Diane Cousteau (born 1980) and a son Pierre-Yves Cousteau (born 1982), born during Cousteau's marriage to his first wife. In 1946, Cousteau and Tailliez showed the film "Épaves" to Admiral Lemonnier, and the admiral gave them the responsibility of setting up the Groupement de Recherches Sous-marines (GRS) (Underwater Research Group) of the French Navy in Toulon. A little later it became the GERS (Groupe d'Études et de Recherches Sous-Marines, = Underwater Studies and Research Group), then the COMISMER ("COMmandement des Interventions Sous la MER", = "Undersea Interventions Command"), and finally more recently the CEPHISMER. In 1947, Chief Petty Officer Maurice Fargues became the first diver to die using an aqualung while attempting a new depth record with the GERS near Toulon. 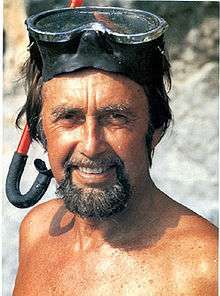 Cousteau also took part in inventing the "Diving Saucer" which was an invention best for exploring the ocean floor, as it allowed one to explore on solid ground. 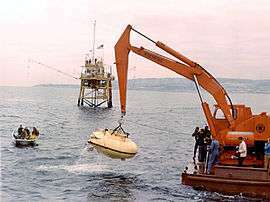 A meeting with American television companies (ABC, Métromédia, NBC) created the series The Undersea World of Jacques Cousteau, with the character of the commander in the red bonnet inherited from standard diving dress intended to give the films a "personalized adventure" style. This documentary television series ran for ten years from 1966 to 1976. 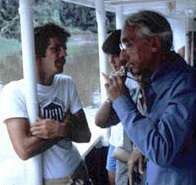 A second documentary series, The Cousteau Odyssey, ran from 1977 to 1982, among others. In 1973, along with his two sons and Frederick Hyman, he created the Cousteau Society for the Protection of Ocean Life, Frederick Hyman being its first President; it now has more than 300,000 members. In 1975, John Denver released the tribute song "Calypso" on his album "Windsong", and on the B-side of his hit song "I'm Sorry". "Calypso" became a hit on its own and was later considered the new A-side, reaching #2 on the charts. In 1976, Cousteau uncovered the wreck of HMHS Britannic. He also found the wreck of the French 17th-century ship-of-the-line La Therese in coastal waters of Crete. On 11 January 1996, Calypso was rammed and sunk in Singapore Harbor by a barge. The Calypso was refloated and towed home to France. 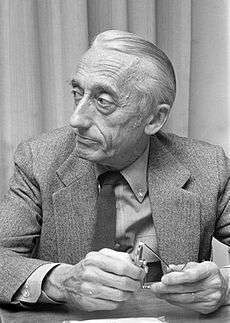 Jacques-Yves Cousteau died of a heart attack on 25 June 1997 in Paris, aged 87. Despite persistent rumors, encouraged by some Islamic publications and websites, Cousteau did not convert to Islam, and when he died he was buried in a Roman Catholic Christian funeral. He was buried in the family vault at Saint-André-de-Cubzac in France. An homage was paid to him by the city by the inauguration of a "rue du Commandant Cousteau", a street which runs out to his native house, where a commemorative plaque was affixed. 1 2 3 "Cousteau Society". Archived from the original on 25 January 2009. Retrieved 12 September 2013. 1 2 3 4 "Jacques Cousteau | French ocean explorer and engineer". Encyclopedia Britannica. Retrieved 2016-03-02. ↑ "le Scaphandre Autonome". Espalion-12.com. Retrieved 10 November 2012. ↑ Ecott, Tim (2001). Neutral Buoyancy: Adventures in a Liquid World. New York: Atlantic Monthly Press. ISBN 0-87113-794-1. LCCN 2001018840. ↑ Riffaud, C. ""La règne du scaphandre à casque", in La grande aventure des hommes sous la mer". Users.skynet.be. ISBN 2-226-03502-8. Retrieved 10 November 2012. ↑ Morton, Michael Quentin (June 2015). "Calypso in the Arabian Gulf: Jacques Cousteau's Undersea Survey of 1954.". Liwa. 5 (9): 3–28. Retrieved 17 August 2016. ↑ "Jacques-Yves Cousteau (1959-1973)". Confédération Mondiale des Activités Subaquatiques. Retrieved 2 April 2013. ↑ Jacob Darwin Hamblin, Poison in the Well: Radioactive Waste in the Oceans at the Dawn of the Nuclear Age (Piscataway, NJ: Rutgers University Press, 2008). ↑ "Accident kills Cousteau aide in Argentina (December 30, 1972)". Chicago Tribune. Retrieved 4 December 2016. ↑ "Hero and Calypso at Deception Island 1972-73". www.palmerstation.com. Retrieved 4 December 2016. ↑ Ohayon, Albert (2009). "When Cousteau Came to Canada". NFB.ca. National Film Board of Canada. Retrieved 25 October 2009. ↑ "Article: Jacques-Yves Cousteau. (Interview) | AccessMyLibrary - Promoting library advocacy". AccessMyLibrary. 1 November 1991. Retrieved 10 November 2012. ↑ "La "conversion" du commandant Cousteau à l'Islam". Atheisme.free.fr. Retrieved 10 November 2012. ↑ Jean-Michel Cousteau (11 June 2010). "Jacques Cousteau "would be heartbroken" at our seas today". Archived from the original on 14 June 2010. Retrieved 12 September 2013. ↑ "It's an Honour - Honours - Search Australian Honours". Itsanhonour.gov.au. 26 January 1990. Retrieved 10 November 2012. ↑ "Diver's Watch Bearing a Piece of Cousteau's Legendary Vessel Watches Channel". Watches.infoniac.com. 27 July 2007. Retrieved 10 November 2012. ↑ "32 Facts About 'The Life Aquatic with Steve Zissou'". Mental Floss. Retrieved 2016-10-21. 1 2 "Watch: First International Trailer For Jacques Cousteau Biopic 'The Odyssey' Starring Lambert Wilson & Audrey Tautou". The Playlist. Retrieved 2016-10-21. 1 2 "L'Odyssée : Lambert Wilson dans la peau de Cousteau". Le Figaro. Retrieved 2016-10-21. ↑ "World Premiere of Wild Bunch-Sold 'The Odyssey' Closes San Sebastian". Variety. Retrieved 2016-10-21. ↑ "Ce que le biopic sur Cousteau, "L'Odyssée", nous apprend de son côté obscur". The Huffington Post (French Edition). Retrieved 2016-10-21.